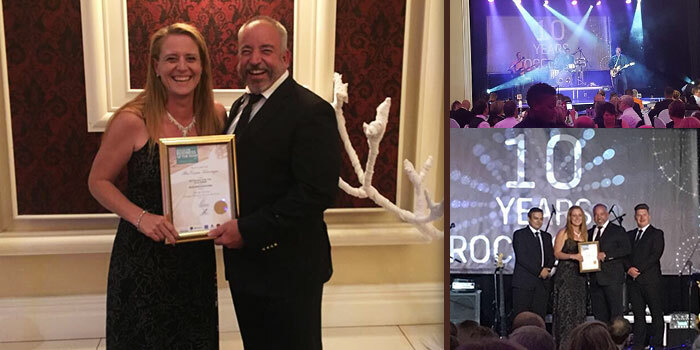 The Roodepoort Chamber of Commerce and Industry (ROCCI) in conjunction with First National Bank (FNB), hosted their Annual Business of the Year Awards Ceremony on 18 November 2017 at Silverstar Casino, where FlowCentric Technologies won gold in the Most Innovative Idea Category. FlowCentric Technologies were awarded this honour in recognition of the company’s continuous investment in its proprietary Business Process Management Software. The dedication has allowed the organisation to expand its partner channel into international spheres, bolstering the South African market. In addition to the awards, the black-tie event also celebrated the 10-year anniversary of the ROCCI/FNB partnership. Happy 10-year anniversary to ROCCI/FNB and congratulations to the FlowCentric Technologies Team on winning Gold! Pictured above: Odette Pieters and Denis Bensch accepting the certificate on behalf of FlowCentric Technologies.